Category Archives: Charlotte’s Spider Facts. What does a Jumping Spider wear for a hat? animals, arachnids, funny pics, Humor, Jumping spiders, Nature, Spiders., zoology. And here we see one of my favorites of the arachnid world, the Jumping Spider who is looking oh so cute. Hehehe. Charlotte’s Spider facts – The Cobalt Blue. arachnids, cobalt blue, handling, Nature, spider facts., tarantulas, zoology. She’s incredibly beautiful, but don’t touch! Haploplema lividum is a psychotic, high-strung burrowing species from Southeast Asia found in tropical forests. They like high humidity and temperatures. There is an excellent caresheet for this species at petbugs.com. Being an adult, the big girl doesn’t eat lots, but she likes her crickets. She’s big enough to take down some substantial sized prey, and she has accepted a roach and zoophoba when offered. The smaller one is still on fairly small crickets. Not sure what she’s munching, but it’s not my hand. She lives in one half of a 10 gallon aquarium with deep bedding, a water dish and a cork shelter. Check out the breeding page for more details on this breeding tank. The smaller one lives in a small round pet-pal. She started burrowing as soon as she was moved into this cage, and really has a fantastic burrow going. It goes straight down the corner of the cage behind the cork shelter, then around the side. The turret at the top is like a giant cartoon anthill. The humidity outside the burrow isn’t particularly high, but it’s probably up around 80% in the burrow. The temp in the spider room is 80-84°F. The baby is not quite so nasty, but it is naughty and will go on a runabout if bothered. Surprisingly fast little bugger. The Peacock or “Jumping” Spider. animal kingdom, arachnids, Australia, Australian Spiders, documentary, fun facts, Jumping spider, Peacock Spider, Spiders., zoology. 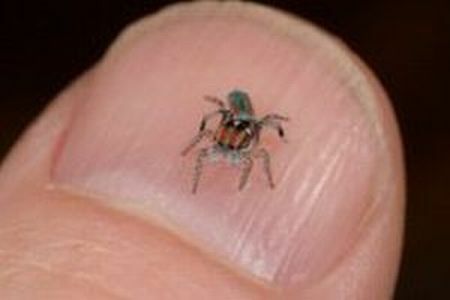 The jumping spiders are the personalities of the spider world. Though generally small in size, their large eyes, prodigious jumping ability, often brilliant colours and cocky, inquisitive activity make them very appealing. Many are daylight hunters, using their excellent vision to track, stalk and calculate distance, before suddenly leaping on their prey, propelled by their strong back legs. The tropical species include some of the most beautifully coloured jumpers, notably the metallic-hued species of Cosmophasis and the green and yellow bodied, white tufted Clown Spider, Mopsus mormon, among many others. The tropics are also home to a cunningly adept predator of spiders, the sinister looking Portia fimbriata. Covered with lichen-like hair tufts, this jumper uses stalking, ambushing, web invasion and imitation strategies to attack its prey, which ranges from other other jumpers to web builders. Jumping spiders are diurnal and on sunny days they can usually be found on all types of vegetation. They are found in a variety of habitats. Males are often more strikingly coloured, patterned or adorned with leg or body hair tufts than are females. They use these adornments to impress the females during often elaborate courtship displays. 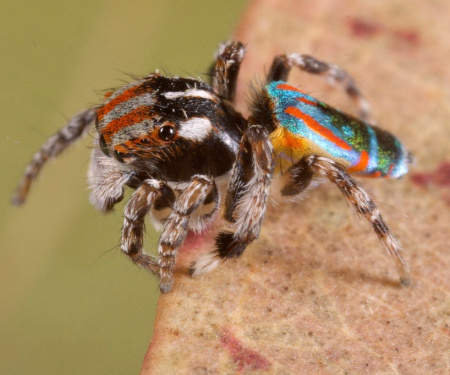 No group illustrates this better than the southern Australia jumpers of the genus Maratus (= Saitis). 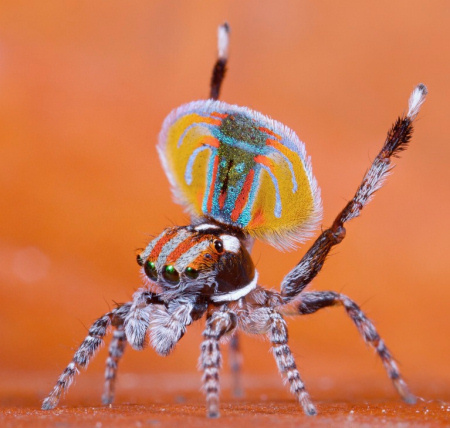 Its members could justifiably be called peacock spiders, both for the bright colours of the males and the way that they display them. Males have flap-like lateral extensions of the abdomen that fold down along each side and are edged by white hairs. When a red, blue and black coloured male of Maratus volans courts his relatively nondescript mate, he expands and raises the lateral flaps so that the abdomen forms a white-fringed, circular field of colour which is tilted up towards the female above the brightly coloured carapace, a truly spectacular sight. arachnid, Australia, Australian, deadly creatures, facts, Funnel Web, Spider, Spiders., venom, writing, zoology. Since I have something of a love affair with spiders for my writing and role playing, decided to start a blog, dedicated to my favourite arachnids. Now, the first one I have chosen, truly is one of the most feared in Australia. No other is quite as aggressive, and to be sure, you won’t ever forget, if you are bitten by one. Showing a bit of aggression. Notice the difference in size, from the female to the male. 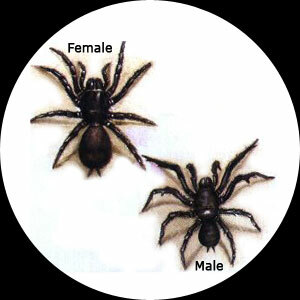 The Sydney Funnel-web Spider is a very aggressive species and one of the deadliest spiders in the world. 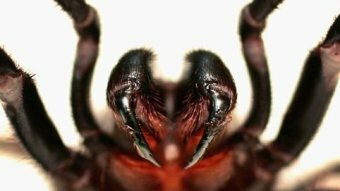 The cephalothorax is almost hairless and appears smooth and glossy black. The abdomen is black, dark brown or purplish in colour. The body and legs are covered with fine hairs. The male has more slender legs and a spur on the third segment of the second leg. This tiny spur is used to hold the female’s fangs during mating. Funnel-webs are extremely aggressive spiders and when threatened they raise their front legs high off the ground and point their fangs forward ready to strike. When they strike they drive the fangs down with force and speed. Fun Fact: Apparently, like white men, Funnel Webs can’t jump.